For conservatives and libertarians the presidential election of 2008 holds little promise; there is no strong conservative candidate, and the only libertarian candidate has very little chance of being nominated. So, when you look over the Republican field, which is the only place you would be likely to find a conservative or a libertarian, it becomes difficult to pick someone that you really can believe in, and that you can strongly support. It is mostly a matter of disqualifying candidates because of their ideological shortcomings, as opposed to strongly getting behind a candidate that shares your beliefs and ideals. As someone who is conservative but not really a Republican, I will likely vote for whomever the Republicans nominate, for the simple reason that none of the Democrats can qualify under my strict conservative/libertarian criteria. Just who that will be, I have no idea; it’s too early to make that determination, and I’m a lousy predictor of such things, particularly these days, when I don’t have the time to really follow politics. 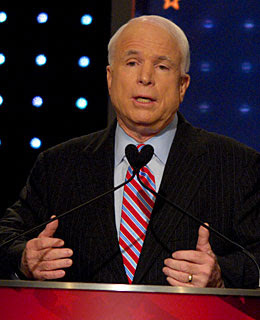 I have never supported John McCain, although I will vote for him if he is nominated for the reasons previously enumerated. But McCain has many, many shortcomings. An excellent description of McCain’s strengths and weaknesses, written by columnist Jay Ambrose, lays out my feelings about McCain. If you have any interest in John McCain, I urge you to read it.